Hi everyone! Welcome back to the blog! This post contains affiliate links. Now that it’s officially Spring, I wear dresses to work almost every day. Out of my whole drawer full of lotion, there are two that stand out to me. My favorite all time lotion is the Rice Flour and Shea from Bath and Body Works. Last summer, I was quite bummed to find out that it had been discontinued. Why do all of my favorite products get discontinued? Anyways, I searched for a replacement that had the most similar scent. I stumbled upon St Eve’s Oatmeal and Shea Butter which is quite similar in scent but the way the lotion goes on is much better! I didn’t think I could find a lotion that I liked better than the Rice Flour and Shea. The texture of the lotion was more soft and fluffy rather than thick and liquid-like. It also didn’t sting newly shaved pores like the other did. I definitely love this lotion and it comes in a pump which makes it even more convenient. 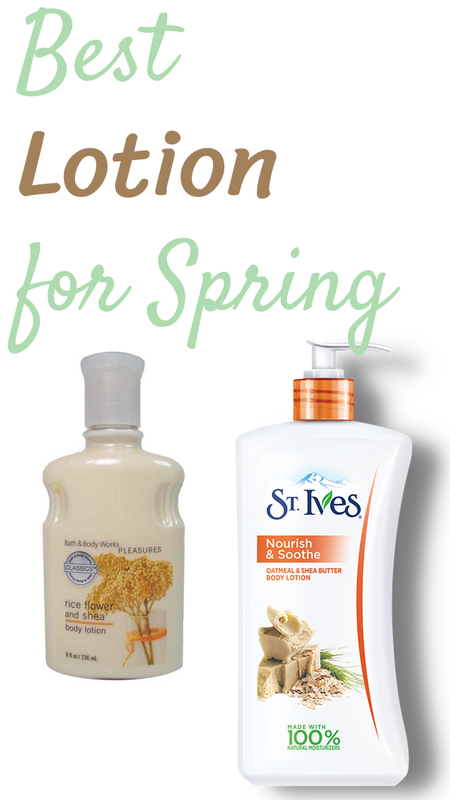 Do you have a favorite lotion for Spring and Summer? What is yours? Great post! I’m always looking for a good lotions. I need to try St Ives, sounds perfect! Oh, I love St. Ives products. I haven’t tried this particular kind with shea butter, but I bet it’s wonderful. Great pick! Will need to check out St. Ives. It’s been years since I’ve used it – good to see you like it! My favorite things always get discontinued too! Frustrating! Thanks for the lotion review – good to know before buying a big bottle. I LOVE that st ives lotion, I literally fly it to Europe with me when I visit the states! So nice.